Well, today was a definite first for me. I saw a geeky science fiction space travel movie and I loved it! Now I am not one who has a fascination with stars, planets, galaxies, or space exploration. That would be David, my husband,whom I might add had two years towards a PhD in theoretical physics before changing careers to architecture. He not only is interested in space , but he knows a lot. My interest in the heavens is the spirttual side of curiosity, frailty of humans, and the turning of human hearts when life on earth is challenging . For me, heaven is sought out when man feels the need for grace, hope, salvation, and escape. In “Interstellar” escape is needed from an unsustainable earth. . . . after droughts, sand storms, and a mysterious blight making food production impossible. The timing for the film when NASA has so drastically cut budgets is ironic where the film is considering man’s place on earth and the celestial spheres. Another aside is the gorgeous, booming organ score which made this a nearly 3 hours church service in the cathedral of space. This quote is used several times to reiterate the theme of survival which is woven throughout the film. But for me, deep emotional bond was the heart of the film. Coop ( Matthew McConaughey) was strong yet vulnerable as he looked for a new home for humanity as well as the deep bond he shared with his daughter. David was excited to see that a theoretical physicist was a script consultant. David said the current scientific thought on gravity which was determined by a woman scientist was presented in the film as well other correct scientific details as in electrical magnetism. For me it was that love was set on equal plain with the science. . . . . pure and powerful emotion. 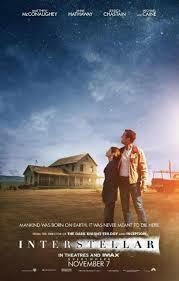 For me the science fiction film was just the setting for an emotional tale of family, survival, journey, death and love. This is quite remarkable that two so different people should be entertained by one film. It rarely happens, trust me ! I wept throughout the film, ( which is best seen on I MAX to experience) it and not just see the spectacular special effects. This means I really connected with the whole experience. I love to cry in films! David, too, was sniffling by the end and that is quite an accomplishment for any film! Rating. . . . . * * * * * out of 5 Stars! Anybody else see “Interstellar” on this its opening weekend? This entry was posted in film, Travel, Uncategorized, USA and tagged "Interstellar", films, Matthey McConaughey, movies, NASA, space travel. Bookmark the permalink. I am glad to here this film has scientist as a consultant. Gravity force is still not well understood among other kinds of force even though everyone is directly affected by it. Oh, please let me know what you think ! Oh David would love that! He doesn’t like chit chat but loves a substantive conversation ! I hope you enjoy the film ! I can understand ~ and why attending parties/functions can be so difficult for me and I would guess David as well 🙂 Looking forward to seeing it, Cheers!